Mechanical Dynamics and Analysis inspected and repaired a double flow low pressure (DFLP) rotor and inner cylinder after a generator motoring incident. 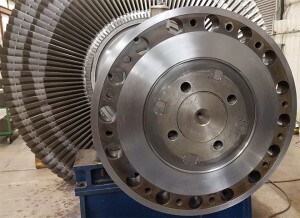 Our experts removed and replaced six rows of rotating blades along with machining the horizontal joints of both halves and certain bores of the inner cylinder to enable the unit to return to reliable operation. Motoring is the mode of turbine-generator operation during which the generator acts as a synchronous motor, taking energy from the grid to drive the turbine at operating speed. Motoring can be problematic, however, because the rotor blades are moving at a high velocity without the steam to keep the last stages of the LP rotor cool. MD&A’s engineering and technical expertise provided cost-effective solutions for a power plants after such damage. The power plant customer expected to find damage in the LP section because of the motoring event. MD&A performed an on-site steam path damage assessment. Damage to the DFLP rotor was noted, and the customer sent the rotor and inner cylinder to the MD&A’s Turbine-Generator Repair facility in St. Louis. 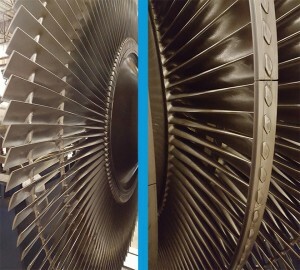 During the rotor inspection, both the governor end and generator end L-2 blades were found to be twisted. A governor end L-1 blade had a large crack emanating from the admission edge just inside of the lashing lug. Multiple covers were missing from the generator end L-1 blades. This caused heavy foreign object damage to both the generator end L-1 blades and tenons, and L-0 blades. This damage led to reliability concerns with the L-0, L-1, and L-2 blades so the best solution to ensure the rotor’s future reliability was to replace all six blade rows. 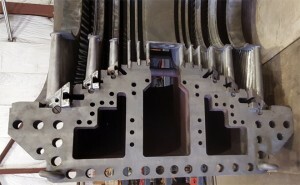 Roundness and horizontal joint gap checks were performed as part of the LP inner cylinder inspection, and the bore was found to be elliptical. MD&A machined the horizontal joint to decrease the out of roundness and close up the horizontal joint gaps, as well as, machined the bore to increase clearance. Once the LP rotor repairs were completed, the rotor was balanced in MD&A’s high speed balance facility. During the balance, a sudden shift in the rotor imbalance occurred. It was determined that the coupling shifted when the rotor was tested at 110% of its rated speed. After consulting with the customer, MD&A removed the coupling and performed a full inspection. MD&A experts found that the rotor did not have a hole for the coupling radial pin. In fact, the pin was making contact with the outside of the shaft. Once the coupling keys were removed, the coupling was found to have shifted. The evidence suggested that the coupling was subjected to a large amount of torque during the motoring event and that this caused the coupling to shift. If it were not high speed balanced in a controlled environment, these coupling issues would not have been identified until the unit was reassembled and put back into operation, at which time the customer would have experienced extensive delays and costs to fix the issues. The coupling was then re-installed onto the rotor, a hole was drilled into the shaft for the radial pin, new keys and a new pin were manufactured and installed, and the coupling face, rabbet fit, and outer diameter were re-machined. This allowed for the proper balancing of the rotor. This project is just one of the many examples of MD&A’s expertise to fix difficult rotor issues.